In 1991 I wrote a text for Vancouver Anthology that considered the history of Artist-Run Centres (ARCs) in Vancouver.1 Since then, almost twenty years later, the conditions affecting ARCs have changed. They have a more visible presence within the larger cultural scene, and the audience for visual art has correspondingly expanded. The era has passed when one knew almost everyone at each opening reception for an exhibition. The breadth of audience for ARCs was primarily limited to the art community itself, but now a wider segment of the public is present, one that includes not only younger generations and the various stakeholders in the art community, but also a growing audience consisting of the culturally curious, those who might be relatively new to contemporary art but are interested in exploring what it offers. Two decades ago, Vancouver artists were faced with few public gallery opportunities—Vancouver Art Gallery, University of British Columbia Fine Arts Gallery, Charles H. Scott Gallery, Presentation House Gallery, Burnaby Art Gallery, and Surrey Art Gallery. Even fewer private galleries offered their clientele challenging work that at first might not appear to have commercial potential—among them Douglas Gallery, Pender Street Gallery, NOVA Gallery, Coburg Gallery, and Convertible Showroom—and each of them for one reason or another proved to be unsustainable in Vancouver. Although the number of public galleries remains much the same today, there is an increase in private galleries and, in particular, ones that are consciously positioning themselves as representatives of the most progressive contemporary art in Vancouver, and achieving some success. On the other hand, Canadian ARCs were, and in most cases still are, like other public galleries, dependent upon state funding for the majority of their operating budget. Because state support has been available—and for ARCs it has been in place for more than thirty years—one can speculate that the government recognizes these institutions as valid manifestations of contemporary culture, and, thus, it values them. Within the Canadian art community, reliance upon the state is something accepted, even expected, no doubt because the Canada Council for the Arts, and then provincial and civic cultural departments, were instrumental in initiating and setting up funding programs for such galleries in the first place. The 1970s and 80s, for example, was a time when few Vancouver artists who were exhibiting in ARCs seriously considered a move into the private marketplace with all the creative compromises that it potentially would entail—instead, they preferred to be associated with galleries that represented a resistance to commercialism, among them Main Exit, Video Inn, Women in Focus, Western Front, (N)on Commercial, Worksite, Or Gallery, Artspeak, and grunt gallery. The mind-set was that art functions as a philosophical or political enterprise, a practice, rather than a commercial or careerist one, a product. As a self-conscious community of artistic spaces in the 1970s, the ARCs’ initial purpose was to place artists in the role of determining the selection, presentation, and dissemination of contemporary art, of serving the artist as a social citizen and as a cultural producer, of providing options outside the commercialization of visual art, and of creating a parallel system that would provide alternatives to the inadequate one that was already in place. But that was four decades ago. It was not really anticipated that those ARCs would still be functioning today, yet many of them are, and many of those ideals remain at the core of their organizational mandates. But with increased demands from state funders for ARCs to become more accountable to the public and to raise additional funds from private sources, this supposedly alternative system has become increasingly integrated into the larger art system. In my 1991 text, I brought into question this idea of alternative as an emblem of what ARCs symbolized in their relationship to the larger art system. I noted that artists who were represented by private galleries in Toronto were showing in ARCs in Vancouver, a convergence that brought into question the ARC claim of representing an alternative. So I read with interest Vancouver Art & Economies (2007), an anthology that builds upon Vancouver Anthology in its analysis of recent Vancouver art. Two texts in particular caught my attention: Reid Shier’s “Do Artists Need Artist Run Centres?" and Michael Turner’s “Whose Business Is It? Vancouver’s Commercial Galleries and the Production of Art. "2 While these two titles initially appear antithetical, they are, to my mind, connected in the context of current artist-run culture. Both Shier and Turner raise two issues that are not new but contribute to a further understanding of a growing shift within Vancouver’s local cultural ecology. They suggest that the boundaries between ARCs, public galleries, and private galleries are increasingly ambiguous and that curatorial practices, formerly the specialized domain of museums and public galleries, have become increasingly entrenched within both ARCs and private galleries. Shier points out that while ARCs are an important venue for emerging artists and the often contentious work that accompanies them, museums and private galleries are now equally attentive to embracing this generation and incorporating challenging content into their programming. He sees this as impacting upon ARCs as protectors of “alterity" or realizing an “oppositional role," indeed, of possessing a “critical purpose," especially one directed at the art system and the artist’s position within it. Such critical purpose could now be seen as giving way to the pressures of, and even desire for, professionalization within what has become a formidable art industry exerting its own regulatory rules and protocol, especially if one desires to succeed within it. With this shift in the art system, ARCs are now forced to compete with other institutions that have wedged their way into what was assumed to be ARC territory. Although the traditional fissure between artist-run culture and the market is narrowing—not just the monetary market, but also the marketing of careers—it appears to be less of a problem in the early twenty-first century. On a practical level, artists do have to survive financially, and I alluded to this in 1991. Even though the arts are becoming more seamlessly incorporated into the leisure industry, wherein visual art is increasingly presented as an element of entertainment, it is not free entertainment. Unlike theatre and music, which have unions, the visual arts still rely upon massive amounts of unpaid labour and materials, an issue that has been unresolved for decades within the ARC system, as well as by state funders. Larger public galleries in Vancouver, and even some private galleries, are at times able to contribute to production costs and to realize the increasingly elaborate projects some artists now propose. Accordingly, many artists who emerged from the ARC system have willingly entered the larger art system, where historical legitimation and financial reward hold more promise. Twenty years ago, few Vancouver collectors ventured into the world of ARCs to explore, and perhaps support, what was considered new or experimental art. Moreover, few private galleries drew upon ARC artists, but more recently, Catriona Jeffries Gallery, Tracey Lawrence Gallery (now closed), Monte Clark Gallery, and Republic, among others, have indirectly acknowledged the importance of ARCs by recruiting into their galleries artists whose practice was developed in non-commercial spaces. This is a scenario different from that of the U.S., for example, where there are far fewer ARCs per capita and where landing a commercial gallery is more often the first concern for artists graduating from art colleges, institutes, and universities. South of the border, most artists find legitimation first in private galleries and only later in museums and public galleries. In Canada, it seems to work the other way around. Legitimation is first achieved through exhibitions in ARCs or smaller public galleries, then larger public galleries and museums, and, finally private galleries. Yet the speed with which artists move from ARCs to private galleries is increasing significantly. For example, it did not take long for Tim Lee to secure private gallery representation in Vancouver (or in New York or London). His first ARC solo exhibitions at Vancouver’s Western Front and Or galleries, and then at Toronto’s YYZ Artists’ Outlet, provided an opportunity to see his work in a professional gallery setting, in a context where the artist likely was fully involved, and where the intentions of the gallery were directed to the development of a discourse rather than a sale. Not that the desire for private gallery representation is absent from the minds of artists; likely, Lee already had his sights set beyond ARCs. With the success of relatively younger artists on the commercial scene and achieving international exposure early in their careers, something Shier alludes to, attracting financial success, or at the very least financial viability, no doubt holds appeal. Another subject that Shier and Turner bring up has to do with the idea of the curatorial role within ARCs. The programming model in most Canadian ARCs relies on the selection committee—one consisting of artists, staff, and frequently board members—in which the exhibitions come to fruition through the work of a staff member who is rarely called a curator but instead something more like an exhibition or program coordinator. In Vancouver, we call curators curators, and, as Shier remarks in his text, curators working in ARCs are not always artists, another tradition we have accepted during the past twenty years.3 For Shier, ARC programming committees, despite their claim to a more democratic process and serving to diminish hierarchical structures, do in fact assume a curatorial role; they “gate-keep" and “edit," and, therefore, their process of selection is fundamentally not so different from that of a curator, except that perhaps the direction, or the much-vaunted curatorial “vision," may be less focused. One important question in this discussion is whether the curatorial process might compromise the intentions of the artist. The curator–artist relationship has evolved during the past two decades, and as ARCs have contributed significantly to this evolution, the curatorial process as it exists today is not determined solely by the agendas of larger public galleries and museums. In ARCs, the process of putting together an exhibition has long been a collaborative one between the artist and the curator (or exhibition programmer). While it may be a curator who decides upon the artist and even the work to be exhibited, the artist generally is involved in many or most decision-making aspects of the exhibition. This practice, indirectly supporting the artist-run concept in ARCs, has made its way into larger public institutions, where artists now wield considerably more power in the presentation of their art than they did in the past. And artists have come to expect this. Michael Turner’s overview of private gallery activity in Vancouver brings into play a number of the same issues that Shier proposes, especially in terms of curatorship of exhibitions outside of public institutions, in particular private galleries, and the overlap of artists showing in both ARCs and private galleries, something that further exacerbates the question of the difference between them. Artists showing in both private galleries and ARCs is a more accepted occurrence today; one example that Turner relegates to a footnote—Myfanwy MacLeod’s two same-night openings during the 2001 ARC multi-gallery season opener SWARM, one at Catriona Jeffries Gallery, and one at Or Gallery—was its most blunt manifestation, although little comment was made. What was the difference between these two exhibitions? That night the blending was complete, and in a sense the Or Gallery abdicated its alterity; ironically, the title of the exhibition was The Tiny Kingdom. In his text, Turner identifies a trajectory of curatorial practice within the history of private galleries in Vancouver. The perverse paradox that strikes me in reading it is that a kind of reversal has indeed transpired over the past two decades. While in 1991 I was suggesting that ARCs were entering the territory of the private gallery, the private gallery has now entered the territory of the ARC and the public gallery. Catriona Jeffries Gallery, Monte Clark Gallery, Art Beatus, and Atelier Gallery (now closed) have all at one time or another experimented with independently curated exhibitions drawing upon the imagination and knowledge of freelance curators.4 Catriona Jeffries Gallery has made the most stunning and confounding private gallery exhibitions in Vancouver in recent years. She has presented exhibitions, and not in ARCs but in her own gallery, by Germaine Koh and Geoffrey Farmer, for example, that seemingly have little commercial potential. How can you sell a mock bus shelter constructed to the specifications of Jeffries’ storefront gallery, such as the one Koh presented in 2005? How does one package Farmer’s constantly morphing installations into a consumable product? Is the private gallery, then, attempting to present what the artist aspires to make beyond what could be considered a commercial enterprise, thereby representing the integrity of that artist while anticipating the provision of a viable financial return for both? For the most part, in Canada at least, ARCs do continue to be a part of what Shier calls the “feeder system" to the larger art system. While in past decades the Vancouver Art Gallery, for instance, presented exhibitions of young artists—Young Romantics (1985), Broken Muse (1986), Topographies (1996)—they were far and few between. Today, younger artists, many of whom gained recognition in the ARC system, are more seamlessly integrated into multi-generational and international exhibitions such as Weak Thought (1999), These Days (2001), Drawing the World (2003), Classified Materials (2005), and Visions of British Columbia: A Landscape Manual (2010). While Shier acknowledges the “feeder" role of ARCs, he doesn’t assign it much import, and he recognizes that many artists enter the art system through other means—personal connections, ongoing promotion by a curator, international artist residencies, etc. Yet ARCs have been and still are early venues for some of Canada’s most important artists (and curators). I believe this groundwork rarely receives the acknowledgement it deserves, especially from funding bodies that think ARCs should behave like their more high-profile public galleries and museums. For most ARCs, the resources are not available to achieve this public profile. Given the groundwork that they do provide, is a public profile ultimately an important aspect of their mandate, and is the time spent building a public profile a productive use of limited funds? If ARCs are for some artists a first step leading to recognition that is achieved in a larger public venue, are they not thereby already fulfilling their mandate with respect to public accountability? However, it is not only emerging artists who find value in the ARC. Therein lies another of its distinctive aspects: to offer a venue where the production of art is perhaps less invested—certainly less so than if one was having an exhibition at a private gallery or a much larger public gallery—and where the artist can exercise a greater element of risk. Kelly Wood, for example, presented an installation, Modern Decor for the Poor, at the Western Front in 2004 that was connected to ideas evident in her photography but that was significantly different in its visual manifestation. As a kind of testing ground for new work, the Western Front was a far more appropriate venue than the elite South Granville location of Catriona Jeffries Gallery, her gallery at the time, where the content of the installation would create a different resonance. Jeffries, having since moved to a more discreet light industrial neighbourhood, with an expanded and highly flexible space, is now more able to accommodate such projects. ARCs do not play a role only as a space for Vancouver artists to develop their work. They also provide programming that encourages local artists to think about themselves by looking at artists’ work from other regions—and this may be work with sensibilities at odds with that of Vancouver, or work by artists not yet well known enough for larger institutions. Michèle Faguet, for example, Director/Curator of the Or Gallery (2006–07) and one of the non-artist curators Shier cites, arrived in Vancouver as an outsider with gallery experience from Mexico City and Bogotá and introduced us to numerous artists either from or who have had some affiliation with Latin America. This was an audacious move by the Or board, although it would not be something so unusual in other cosmopolitan cities.6 The impact of Faguet’s programming is yet to be acknowledged, since Vancouver can be a tough city when it comes to art that does not share its particular aesthetic or ideology. It can lack generosity in opening itself up to new or different sensibilities that do not conform to the home-grown image it has constructed for itself, one that is becoming increasingly tight rather than expansive, messy, and provocatively complex. It is a dilemma that raises the question of whether this is a sign of a highly evolved and confident art community or one that is provincial and protective. Getting back to where I started, or rather, ended, in 1991: ARCs and the idea of alternative. Now, with a nearly thirty-five year history behind them, ARCs are, by their very dependency upon federal, provincial, and civic funding, and in spite of their often uncertain role within the hierarchy of visual art venues, a part of the institutional art system, and they are a part of the art gallery ecology that clearly would be missed if they were not with us. So where does the alternative now reside? Perhaps not with ARCs. 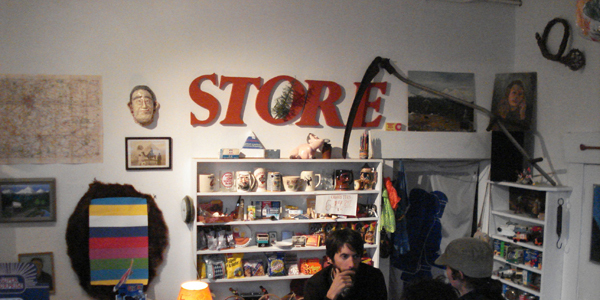 I agree with Shier that an alternative is emerging in truly self-determined spaces such as Gareth Moore and Jacob Gleeson’s St. George Marsh, which he cites, an unfunded artist-run storefront that was a “centre" for exhibitions and events before its contents were sold to a collector (the space then became Cornershop Projects). Alternative has also emerged in “private" galleries that are run by artists or curators (CSA Space, Dadabase [now a virtual gallery]); in home or office galleries (The Bodgers’ and Kludgers’ Co-operative Art Parlour, Trylowsky Gallery); in storefront studios (Gallery Atsui, 221A Artist Run Centre); and in projects where, while perhaps not taking the traditional ARC format of a gallery, the host “space" may be ephemeral (Visible Art Activity, colourschool, the Miss Guides). Whether such spaces and projects arise from a desire to be self-consciously alternative or are symptoms of an ARC public funding system that has little or no room for such initiatives, they are a necessary addition in the hierarchy of artists and curators positioning their practice within an art community that has grown larger and where a genuinely self-determined creative environment is desired. The intentions of these new spaces and projects are not always clear and perhaps are not meant to be—clarity might muddy what it is that can be done. The taint of the market isn’t much of a concern, and work does get sold, even if only sporadically. There is an incredible amount of freedom with these projects: no mandates to follow, no public accountability, no commercial clientele to supply, and the selection of artists isn’t based on community approval but, instead, on the particular interests of the organizers or curators, who often are artists themselves. The audience in these cases has returned primarily to the art community, a community ripe in its ability to present art on its own terms. There is no anticipation of a twenty or thirty year existence, but the energy and integrity of these initiatives, both artistically and curatorially, provide an important contribution to Vancouver’s visual art evolution. ↩ 1. Keith Wallace, “A Particular History: Artist-Run Centres in Vancouver,” Vancouver Anthology: The Institutional Politics of Art, ed. Stan Douglas (Vancouver: Talon Books, 1991), 23–44. ↩ 2. Vancouver Art and Economies, ed. Melanie O’Brian (Vancouver: Arsenal Pulp Press/Artspeak, 2007), 189–201, 205–220. ↩ 3. During the 1980s, among non-artist curators of ARCs were Christine Elving (Contemporary Art Gallery), Cate Rimmer (Artspeak), Monika Kin Gagnon (Artspeak), Daina Augaitis (Western Front), and Annette Hurtig (Western Front). ↩ 4. Curated exhibitions in private galleries have long been common in major cities, usually consisting of group shows featuring one or two works by each artist. A newer trend in New York and London is that of private galleries mounting scholarly, museum-like exhibitions consisting of work accessed primarily from the private sector. ↩ 5. Vancouver Art Gallery, House of Oracles: A Huang Yong Ping Retrospective, April 5–Seeptember 16, 2007; Art Beatus, Xu Bing and Huang Yong Ping, March 7–April 11, 1998 (as part of the city-wide exhibition project Jiangnan: Modern and Contemporary Art from South of the Yangzi River). ↩ 6. Although not an ARC, Centre A (Vancouver International Centre for Contemporary Asian Art) is also assertively bringing to Vancouver work that we do not often have the opportunity to encounter. Centre A also hired a curator from outside of Canada, Makiko Hara, formerly based in Tokyo. Keith Wallace is a curator of contemporary art and Editor-in-Chief of Yishu: Journal of Contemporary Chinese Art.